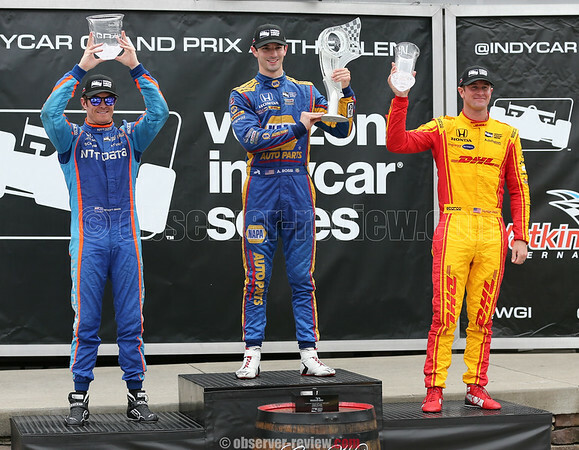 WATKINS GLEN-Alexander Rossi completed a dream weekend with a win in the IndyCar Grand Prix at The Glen, Sunday, Sept. 3. Series points leader Josef Newgarden experienced a collision in the race, and with the points he lost, it now leaves the Verizon IndyCar Series championship battle wide open. Rossi won the 60-lap race at Watkins Glen International from the pole position. The 25-year-old Californian led a race-high 32 laps and drove the No. 98 NAPA Auto Parts/Curb Honda across the finish line 0.9514 of a second ahead of four-time Watkins Glen winner Scott Dixon. Newgarden finished 18th after his car sustained damage in a collision leaving the pits. The Team Penske driver saw his championship lead slip to three points over Dixon with the GoPro Grand Prix of Sonoma race remaining. Seven drivers are still mathematically alive in the title hunt. Rossi overcame a malfunctioning fuel probe on his second pit stop that left him short of E85 ethanol and forced an earlier third stop than scheduled. From there, Rossi laid down laps at near-qualifying pace, regaining the lead on lap 29 and building an advantage of more than 12 seconds. The full-course caution for Newgarden's incident on Lap 46 bunched the field, but Rossi kept Dixon, in the No. 9 NTT Data Honda, at bay over the 11-lap dash to the finish. The victory was the second for Rossi in the Verizon IndyCar Series and first since his memorable triumph as a rookie in the 2016 Indianapolis 500. "An amazing job by the whole team today," Rossi said. "We had an issue in the beginning with the fuel thing, but whatever. It doesn't matter, the team recovered. We had the pace to do it, but it's pretty amazing. It's a huge team effort. I've talked about so much how much we've improved, I'm so happy we're finally able to win." Dixon, in search of a fifth season championship that would leave the 37-year-old New Zealander behind only A.J. Foyt (with seven) on the all-time list, had his own eventual day but was rewarded in points with the second-place finish. "Definitely a good move in the points," Dixon said. "I'm kind of shocked we ended up where we did. I locked up coming in on the first stop on the wet (tires) and it wouldn't downshift, so almost stalled the car, got into the pits and we couldn't fuel it. And then we had a fumble later - we lost another four or five spots - so we had to pass a lot of cars today. Nice recovery by the team, ended up second." Newgarden finished two laps off the pace and saw 28 points shaved from his championship lead. "I felt like we were in a good position until that final pit stop," Newgarden said. "No excuse for it. It was my fault. I saw Will leave right in front of us and I just locked it up and slid over into the wall. Then (Bourdais) got into the back of me. It's unfortunate, but there's nothing I can do about it. We'll go to Sonoma in a couple of weeks and race for it." Ryan Hunter-Reay finished third in the No. 28 DHL Honda. Helio Castroneves placed fourth in the No. 3 Hitachi Team Penske Chevrolet and retained third in the championship. The season finale at Sonoma Raceway offers double race points, making the title achievable for a number of drivers. In other racing action over the weekend, Aaron Telitz won the final Indy Lights race of the 2017 season. Victor Franzoni completed a weekend sweep of the Pro Mazda Championship. Rinus VeeKay was victorious in the USF2000 race, Todd Lamb and Patrick Gallagher picked up wins in the Mazda MX-5 Cup series. Matt Brabham and Robby Gordon were first in the SPEED Energy Stadium SUPER Trucks class.